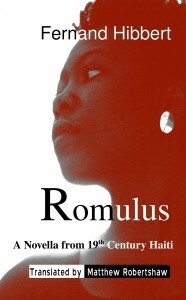 This is the first and only English translation of celebrated Haitian author Fernand Hibbert’s novella Romulus. The story takes place in the prosperous and lively seaside town of Miragoâne on Haiti’s southern peninsula, where a group of exiles disembark to launch a civil war. The town’s residents are forced to take sides as their home is transformed into a battleground. Romulus Joseph, a simple police commissioner, finds himself taking part in the uprising, never fully grasping the philosophy of the rebellion. First published in French and Kreyòl in 1908, Fernand Hibbert’s novella Romulus is an exciting look at a vibrant community as its members live through the thrill and disappointment of one of many disastrous events in Haiti’s rocky history. Hibbert tells this dramatic and satirical tale with as much wit as heart. His themes, both political and emotional, hold true a century after publication.